Nearsightedness, or myopia, is a vision condition that causes people to have difficulty seeing objects that are far away. These patients have problems seeing things such as the school blackboard, traffic signs, clocks, and other objects, but have no problems with close-up objects such as the newspaper. 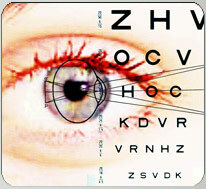 Over ¼ of adults worldwide are affected by myopia. Nearsighted people have to strain or squint to see far off objects and therefore often develop headaches or feel fatigued when driving or playing sports. If you ever have these symptoms while wearing your glasses or contact lenses, you may need an eye examination to verify your prescription. Myopia occurs when the eye becomes longer than normal. The longer eye causes light rays to focus in front of the retina, rather than directly on it. Nearsightedness can be hereditary and usually appears in childhood or adolescence. This condition is often discovered when children first start school. As your child develops during the teenage years, nearsightedness can get worse. Then between ages 20 and 40 there is little change. Excessive computer use or other fixed distance activities such as watching TV or playing video games can also contribute to myopia getting worse. Nearsightedness may be corrected with glasses or contact lenses but it can be improved with orthokeratology or refractive surgery. Nearsighted patients have a negative prescription such as -4.00 diopters. The higher the negative number, the stronger the prescription is. Depending on your prescription, you may need to wear your glasses or contact lenses all day. If not all day, at least when you are at school, work or doing things such as driving that require clear distance vision. Orthokeratology lets you sleep while you improve your vision. This reversible, non-surgical myopia treatment uses specially designed Contex OK Lenses worn during sleep to reshape the cornea. When the lenses are removed in the morning, the cornea retains the new shape all day, so you can see clearly without glasses or daytime contact lenses. The nearsighted eye is longer then normal. Light focuses in front of the retina instead of directly on it.